Secaucus, NJ (January 26, 2010) – Panasonic today introduces the LUMIX DMC-ZS7, the newest member of the acclaimed superzoom ZS-Series of digital cameras that have gained worldwide popularity. Complete with its hallmark 25mm ultra-wide-angle Leica lens and a powerful 12x optical zoom (operable in video recording mode), this 12.1-megapixel powerhouse performer, also includes a new built-in GPS (Global Positioning System) feature that embeds photos and videos with the latitude and longitude location details, a useful feature when using an online photo-sharing website. The LUMIX ZS7 is also the world's smallest photo/video hybrid superzoom digital camera*1, which can also record High Definition (HD) video using the recording capability in AVCHD Lite, which includes a dedicated video record button and new to the ZS-Series is a manual shooting mode. "As a successor to the Panasonic LUMIX ZS3, which was last year's most popular compact model, we are confident the Panasonic LUMIX ZS7 will continue the success, thanks to big features like HD video, 12x optical zoom and the newly added GPS capabilities and it's super-fast Auto Focusing," said David Briganti, Senior Product Manager, Imaging, Panasonic Consumer Electronics Company. "Panasonic is excited to introduce our first GPS-enabled digital camera, and it adds to the ZS7's appeal as the ultimate travel companion – from its range of shooting options, both far and wide, and now the ability to record exactly where photos were taken. We are confident consumers will have all the features they need to capture high quality photos and video and share their travels with their friends and family." The Panasonic LUMIX ZS7 features Sonic Speed AF (Auto Focus), which enables a super-fast response time, and a shutter release time lag as short as approximately 0.006 second. The camera's quick response makes it easier to capture sudden, spur-of-the-moment photo opportunities and together with the Sonic Speed AF that lets users lock on the subject minimum in approximately 0.35 second (wide-end) / 0.41 second (tele-end)*3. The LUMIX ZS7 also features a short startup time of approximately 1.1 second. With the new GPS feature, the Panasonic LUMIX ZS7 is the ultimate travel companion, and can record the latitude and longitude in the EXIF (Exchangeable Image File Format) data, while also displaying the location information real-time while shooting and during playback. These geo-tagged images can be pinpointed on maps common in photo-sharing websites and social media sites – so travels can be archived and also visually represented on a map – and easily shared with friends and family. The Panasonic LUMIX ZS7 also shows the name of the city, country and state, and information for more than 500,000 popular landmarks, covering 73 countries, are stored in the camera's internal memory. For instance, when users are taking photos of the Eiffel Tower or Empire State Building, landmarks stored within the camera, these locations will be displayed on the screen while taking it and tagged in the data. Users can also refer to the locations using the included software PHOTOfunSTUDIO HD Edition Version 5.1. The LUMIX ZS7 automatically adjusts its internal clock to the local time, so there's no need to set the clock manually when traveling. The Panasonic LUMIX ZS7 also features a new image processing technology, Intelligent Resolution, which is incorporated in its Venus Engine HD. With the Intelligent Resolution technology, three areas – outlines, detailed texture areas and soft gradation – are examined pixel by pixel and automatically detected to enhance any degradation created during the digital zoom process or in high-sensitivity shooting. The outline areas are enhanced effectively to give the edges more clarity, while simultaneously giving a moderate accent to the textured areas so it looks accurately detailed. To the soft gradation area, such as a face, the increased noise reduction system of the Venus Engine HD II is applied to make it smoother. As a result of Intelligent Resolution, images are naturally clear and crisp in both photo and video recording. The Intelligent Resolution technology powers Panasonic's new Intelligent Zoom feature, which extends the camera's zoom ratio by approximately 1.3x while maintaining the picture quality – and enhancing the digital zoom and making it comparable to the quality of an optical zoom. With Intelligent Zoom, the Panasonic ZS7 features a total zoom range up to16x. For more advanced users, the Panasonic LUMIX ZS7 adds manual control features, allowing for adjustments in shutter speed, aperture and exposure – and encouraging more creative photography options. For digital camera users looking for an easy-to-use setting that still ensures high quality photos, Panasonic's iA (Intelligent Auto) mode is the solution. Panasonic iA is a popular feature on LUMIX digital cameras, making them intuitive to use without changing any settings, as technologies engage automatically. For instance, iA incorporates Panasonic's POWER O.I.S. (Optical Image Stabilizer), which doubles the repression power compared to the conventional image stabilization system, MEGA O.I.S. 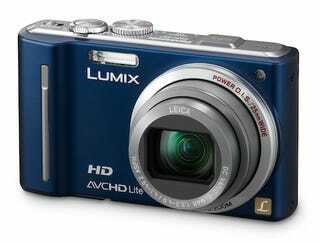 The LUMIX ZS7 can record AVCHD Lite HD video, which almost doubles the recording time in HD quality compared with the Motion JPEG format. To complement the HD video capabilities, the Panasonic LUMIX ZS7 also features Dolby Digital Stereo Creator to record high quality audio. Also, the Panasonic LUMIX ZS7 has a 3.0", high resolution 460,000-dot Intelligent LCD with a wide-viewing angle with excellent visibility during recording and playback.